The October newsletter from Everything Dinosaur features the Rebor “Vanilla Ice” Tyrannosaur figures, a Papo update and the CollectA Brontosaurus. The latest Rebor figures, the “Vanilla Ice” – Jungle (green colour scheme) and the “Vanilla Ice” – Mountain (slate grey colour scheme), have arrived at the company warehouse and after having alerted all those customers who had requested a model to be reserved for them, a newsletter was emailed out announcing that these two excellent figures were in stock. The Rebor “Vanilla Ice” Jungle and Mountain Tyrannosaur figures feature in the October newsletter. The Rebor 1/35th scale Tyrannosaur figures are stunning models. Each figure measures 42 centimetres approximately and both Mountain and Jungle have articulated lower jaws and poseable tails. In addition, to the arrival of these two tyrannosaurids, lots of other Rebor figures have come back into stock, including the very popular “Scout” series featuring juvenile dinosaurs such as “Hazelnut”, a young Triceratops and “Stan”, a baby Velociraptor. Rebor models feature extensively in the October newsletter. The October newsletter features the set of hatching Velociraptors. These hand-painted Rebor Velociraptor figures are supplied in a mystery blind box. With nine different designs in the series, these little pocket money models are fun to collect. Everything Dinosaur has also received a big shipment of Papo figures. The majority of the Papo range is now in stock at Everything Dinosaur including the superb Spinosaurus juvenile, the Iguanodon and the new for 2018 Quetzalcoatlus figure. 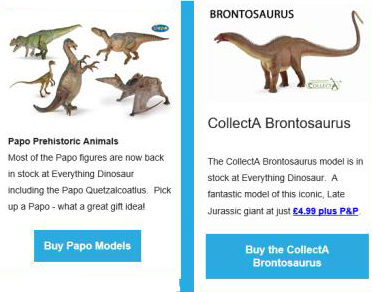 Papo figures and the new for 2018 CollectA Brontosaurus. The newsletter features the Papo Ceratosaurus figure, a famous dinosaur from the Morrison Formation of the western United States. Another replica of a Morrison Formation dinosaur is included as well, the CollectA Brontosaurus model. The CollectA Brontosaurus measures an impressive 30.5 centimetres long and the head height of this Sauropod model is a fraction under 11 centimetres. Everything Dinosaur newsletter subscribers are amongst the first to learn about new models coming into stock. Subscribers can also be the first to join a priority reserve list to ensure that they can acquire new figures. Our newsletter is sent out periodically and it is free to join.